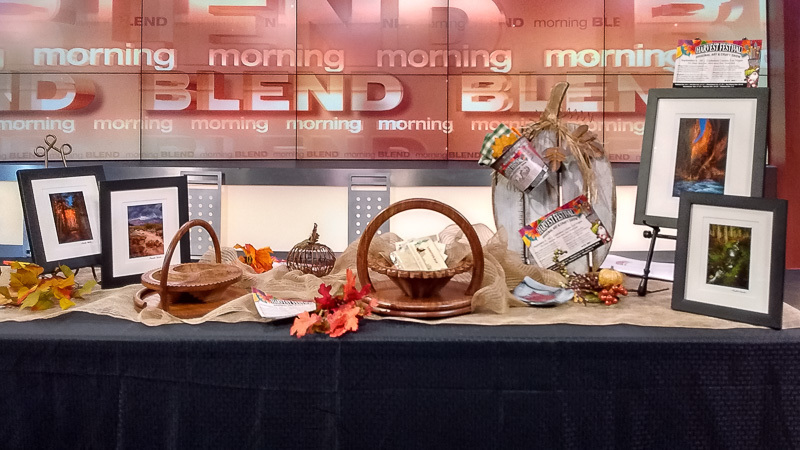 Earlier this month I participated in my first Harvest Festival Original Art and Crafts Show. The Harvest Festivals are juried festivals that have been held for the last 45 years, so it was an honor for me to participate in my first one. In the days leading up to the festival, I appeared on a couple of local TV programs. Here are some behind the scenes images from those appearances as well as links to my interviews. 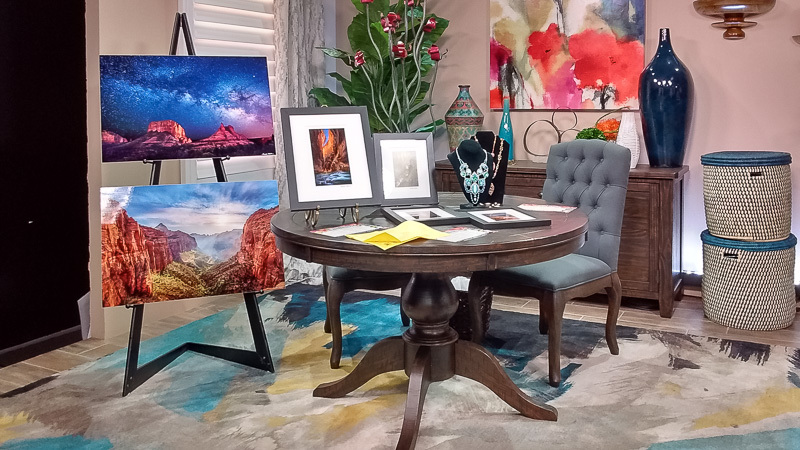 It was a lot of fun going to Channel 13 KTNV in Las Vegas to be on “The Morning Blend.” Click here to see the first part of the interview. The photograph below shows the setup featuring some of my landscape work. One of the exciting parts of appearing on “The Morning Blend” was that Las Vegas comedian/celebrity impressionist/ventriloquist Terry Fator was on the show just before me, and I took this photograph of him while he was live on the air! A couple days later, I woke up very early in the morning to be at Channel 8 KLAS for a 5:50 AM appearance on the morning news. Click here to see that interview. I come on about five minutes into the video. The sets at KLAS were really neat. They had a full working kitchen set on the other side of the room. Here are a couple of phone photos I took of the display of my work. I hope you enjoyed these behind the scenes photographs. I really had a lot of fun doing these interviews, and they also helped make the Harvest Festival even more successful for me. Thank you to Brenda and Chris Meehan of Meehan & Associates as well as KTNV and KLAS in Las Vegas for the great coverage they gave to the festival and to me.